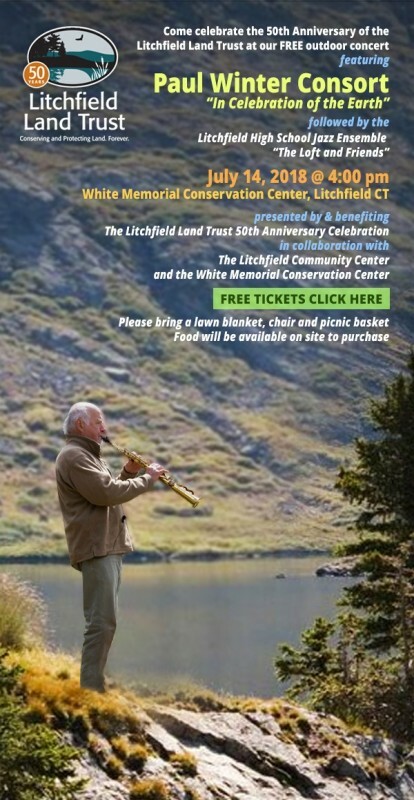 The Litchfield Land Trust will mark its 50thAnniversary in land conservation with a free outdoor concert, featuring Paul Winter Consort, “In Celebration of the Earth”, followed by the Litchfield High School Jazz Ensemble, The Loft and Friends, on Saturday, July 14, @ 4pm. The event will be held at the White Memorial Conservation Center and held in collaboration with White Memorial and the Litchfield Community Center. Participants are encouraged to bring a lawn blanket, chair and picnic basket. Food will be available on site for purchase. Free tickets can be obtained at www.litchfieldlandtrust.org.